Chris Rhatigan makes a welcome return to the Gutter as we take a look at his dark and moody novella, The Kind Of Friends Who Murder Each Other. What’s more this one won’t cost you a red cent. Simon is the kind of guy who was born to lose, and lose badly. His life consists of a minimum wage job at a convenience store, a low rent apartment and a couple of lower rent friends in Slade and Mackey. One night at the bowling alley the three amigos confess their past crimes over a beer or ten and bind themselves together with their misdeeds. While It seemed like a good idea at the time, in the cold light of day Simon isn’t so sure. He can't help wondering why that cop car is always parked across the street from his apartment. Did the bartender at the bowling alley overhear them, had Slade or Mackey ratted him out to save their own skins? Just because he's not paranoid, it doesn’t mean that nobody is out to get him. I really dug this book. The story hooks you early and keeps a firm grip as Rhatigan skillfully delivers a dark and unsettling blend of Hitchcock-like paranoia and motiveless crime. Told from Simon’s absorbing, but off-kilter perspective, the narrative almost feels like a classic art house movie where all the scenes are shot in soft focus or from unusual angles. I think Chris Rhatigan may just have taken noir fiction to a whole other place; perhaps he has even pushed the boundaries a little. The Kind of Friends Who Murder Each Other is the literary equivalent of a Salvador Dali painting. A place where all the elephants have impossibly long legs and the clocks seem to be melting. The blurb discribes this excellent novella as "weird noir", in truth I'm not sure what to call it, but I do know I like it. 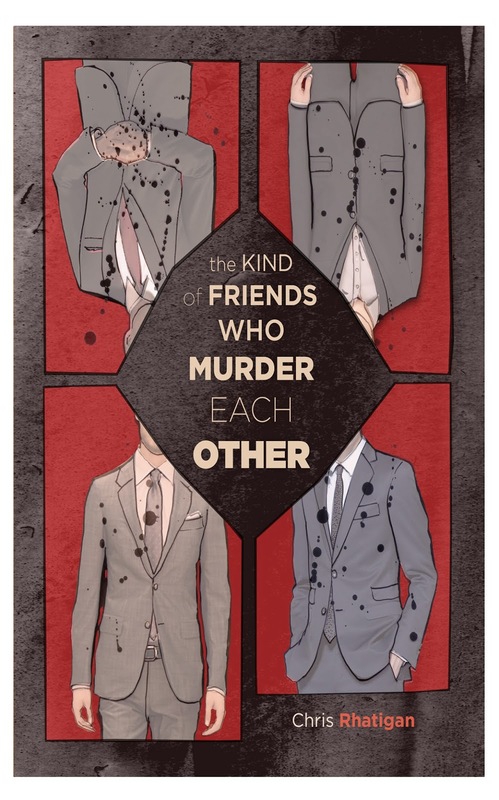 You can download The Kind Of Friends Who Murder Each Other from Smashwords for free, that’s right; you heard me, zilch, nada, bupkis. But why not man (or woman) up and part with a little green for the print edition instead?